Sporadic 'E' in 2003 - A summary | Last update 30.07.03, 18:00 UT | You are on /..July 09. Again and again and again - I wonder whats goin' on in the Ionosphere this year? This aint normal. Today is just a 1 to 1 copy of yesterdays 144 Es. Not that much QSB and much more activity in Spain and Portugal today. But the cloud was almost at the very same place, really strange....In early the morning MUF was pretty high, OIRT R5 was booming here in JN49 at 0700 UT. Later this cloud started moving west and on its way we had BC from SV, I, 3V8 and 7X in DL until noon. Nothing on 144 but a short and spotty opening from F to CT and CN8 and another very short one from G into EA7. The "big bang" came in the afternoon, absolutely similar to yesterday. At 15:15 first 144 sigs from EA7 into DL and from EA1 into S5 and 9A. Few minutes later a big opening started from southwest to northeast and from northwest to southeast. 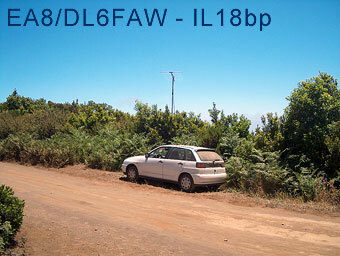 Again CN8 and EA8/DL6FAW was made, just like yesterday. This one lasted until 17:25 UT. Very loud and strong BC from EA until late evening into DL and G.
2 m band sounded like a pile up on 20m band. But be pacient!!! is not possible make all contacts in a short but strong opening like this! Maybe in the next days! Thanks for all to call me. Only one QSO today. I come back from QRL and the ES going at the end. Mni stns heard, ea5ajx over 45min here, mni qsb, lot of qrm (as usual) in jo31. P.S. : I'm qrv since 1978 but can't remember so many openings in a row, 2003 es-season is fantastic so far! Also today I switched the TRX on suddenly after turning back from QRL. And I had more luck as yesterday :-) Could work 10 stations from here. Perhaps tomorrow next opening at same time? Stand by guys!! Its a pitty, heard working the stations around me to Spain from 1605 to 1715 - here in JO41GG nothing heard. MUF on 3m only 95MHz - receivers and antennas are ok! Heard mni more EA and CT as well as CN8. Impossible to work EA8, always a sudden pile when I was calling for EA8 from the rest of EA :-). Very surprised to work CN8KD, because for 20min. no signals. Strong local QRM during the QSO from DF8AE who asked me if really hear CN8KD.... no comment. locator. after these opening an festival on broadcast (3m) started. PA...;-)) As already Cesar mentioned: Veni-Vidi-Vici! Another openning to PA/ON area for two days running and for the third time this year. The best for me was working F1EBE in JN09 for my square #500 on 144 MHz !! At 16:45 I had to leave home when the band was still open..
Today's opening was very similar to yesterday, the distances a little bit longer, but cloud almost in the same place as yesterday. Heard several EA8 stations (Tropo) calling CQ ES (EB8BTV, EB8AYA, EA8/DL6FAW, CN8KD). Again bad opened nearly at time i have to leave for going to qrl , when returned at home opening was ending. Hoping for one Es during weekends ! And again Es this afternoon but very difficult here the cloud seemed to be in jn13 (a little short for me). Only heard and worked one strong station here. Again I drove home from work listening to Arabic on the FM radio but was there any 7X activity....... I suspect that most of my RF was landing there. Bad direction for me ,so was pleased to manage one contact! Also heard EB6ADS JM29DV for a few seconds. Came in from work and managed just this one qso. I was able to hear him for less than a minute. Here another small report from Central HB9. One QSO with CT1DMK IN51. Heard as well again EA8, but no chance off working him. All in all again just alot off noise in JN47ce. Hello, it compliments for your situated and remarkable and interesting job of collection qso in several the methods of transmission, finally the 09/07/2003 are successful to make 2 qso in ES, mine qth (encircled PRIO' 720MT)e' from dolomiti mountains (2000-2800mt). My conditions of job are: 4x17 f9ft and ts700g Kenwood. Worked some ES with backup station: FT-857, 50w, 12el (I0JXX) The IC-7400 is in reparation after 14 days working (Was brand new) Hope to work some more. Hi Udo, I envy your QTH, as it seems to be normal for you to work CN8 and EA8!! [Thats true, JN49 is a 'hot spot' for both CN and EA8, more to come soon, Ed.] I've only hrd/wkd EA8 once! Anyway, this evening was better than yesterday, pity that the area was on exactly the same position as yesterday. Having poor takeoff in direction EA/CT I'm very pleased with my score. Tomorow will put 12 el.yagi on the roof.